A short while after I took this photo the bull mounted the cow. I shot this image through through a Nikon 300 f4 with a 1.4x teleconverter and liked how this angle seems to suggest the closeness of their partnership. *Moose is an Algonquin term for "twig eater." They eat up to 44 lbs (20 kg) each day. 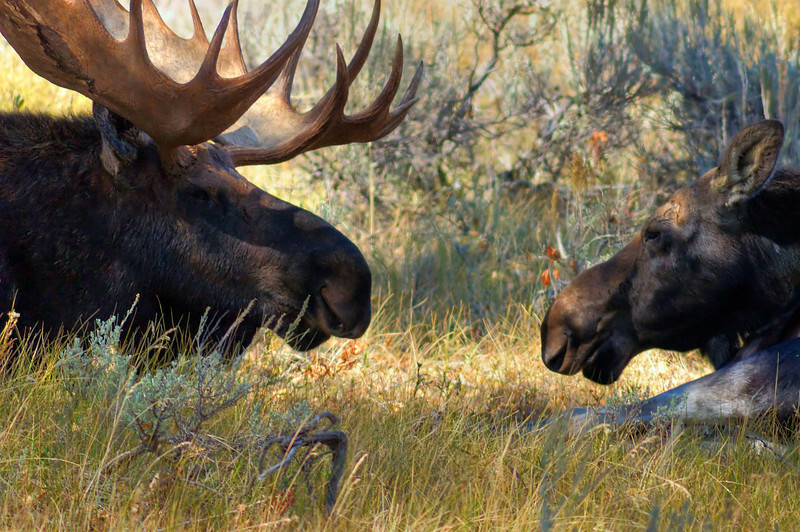 *Moose is the largest of the deer family and the largest mammal in North America. *They're tall! From shoulders to feet adults can be around 6-7 ft (roughly 2 m). Mature bulls often weigh in at more than 800-1,300 pounds (360 to 600 kg). *During mating season, females attract males with their deep calls and strong scent (I can attest this male was definitely interested in her scent and calling). *Bulls grow antlers in the spring and then shed them in the winter. The adult males also have a long, floppy dewlap that hangs below the throat (its purpose is unknown). Here's a shot ( http://www.flickr.com/photos/fortphoto/291195622/ ) of a female moose from the same location.